It’s safe to say coconut oil is my new favorite baking product. It won’t replace the flavor of butter, but I love how coconut oil makes pie crusts flakey, gives cookies crispy edges, and adds a dense, soft, moist quality to quick breads. And wouldn’t it be nice if its purported health benefits were true? If you believe what you read, coconut oil alleviates Alzheimer’s symptoms, helps prevent high cholesterol levels, strengthens the immune system, aids digestion, facilitates weight loss, drives the kids to school, takes out the trash, cleans the baseboards and walks the dogs. Read up on it and you’ll see! This past year I tried a few different brands of coconut oil. 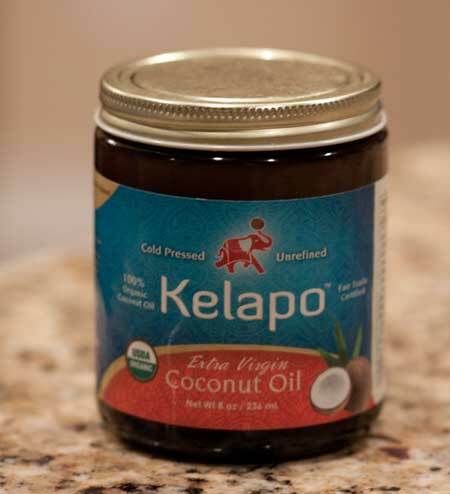 The inexpensive type I found in the baking aisle of Wal*Mart was good for frying tortilla chips or popping popcorn, but the best coconut so far is Kelapo extra virgin. They sent me a sample last week and now I’m hooked. It’s creamy white, smells like coconut and adds a faint coconut flavor to baked goods. Plus I like how it’s packaged in an amber bottle designed to keep out the light and stay fresh for a full two years. Kelapo’s consistency varies with the temperature, but my sample is about the consistency of shortening. It can be spread on toast, added to smoothies, spooned over oatmeal and used as a skin moisturizer. For now, I’ll stick with baking and work my way up. If I’ve convinced you to try coconut (or if you’re just wondering what took me so long to discover it) here’s a recipe that uses it. It’s adapted from my favorite Vegan cookbook author, Dreena Burton, and a lot of people have commented or emailed saying the cookies are even better made with coconut oil. The Kelapo adds a tiny bit of flavor (though one might not recognize it as coconut oil at first), but more importantly it keeps the cookies tall and fat. I didn’t press my dough down before baking so mine are a little too fat, but they taste great. I used Hodgson Mill whole wheat pastry flour, but if you like more traditional cookies, use all-purpose. Vegan chocolate chip cookies made with coconut oil. In a medium size bowl, thoroughly stir together the flour, salt, baking powder, baking soda and sugar. In a mixing bowl, stir together maple syrup, coconut oil and vanilla extract. Add the flour mixture to the oil mixture and stir until combined. Stir in nuts and chocolate chips. 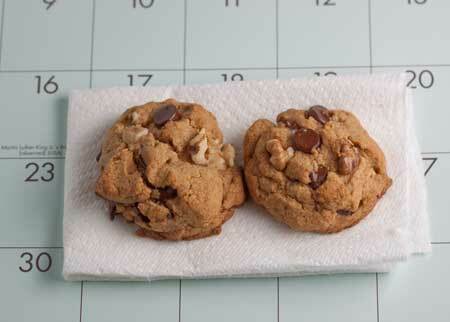 Drop by rounded tablespoonfuls onto ungreased cookie sheet and bake for 11 minutes. **I've noticed pastry flour can have different weights by brand. I used Hodgson Mill brand which weighs about 4.5 ounces per cup. If you're using a different brand or bulk bin pastry flour, you might have to use a little more flour to get 4.5 ounces in a cup. Cookies will spread less if you shape the dough into mounds, chill the mounds and bake the chilled mounds. Great recipe! These cookies are delicious. This is one of the few chocolate chip cookie recipes were I had everything on hand. Will definitely make again. Thanks! Wow, these are seriously amazing. Many thanks!!! Eating these right now… fresh out of the oven. They. Are. DELECTABLE. Really, really delicious. My husband and I decided to try a week of vegan (success!) and are rewarding ourselves with these fabulous cookies. Typically omnivores and gluttons of butter, milk and eggs… I can honestly say, these cookies aren’t missing a thing. This is absolutely my new go-to chocolate chip cookie recipe! Thank you! Jen, thanks for the helpful tips! Glad you liked the cookies. These were awesome. I used the vegan butter flavored sticks as the hubby likes the “butter” taste. Doubled the recipe, used sucanat instead of granulated sugar. My dough was a touch sticky so I added another 1/2 cup pastry flour. Delicious! Thank you! These were VERY easy to make and tasted great. My husband and I have very different taste buds. What I like, he doesn’t. He kept complaining about an aftertaste, which I didn’t get. I couldn’t find Kelapo brand Coconut Oil so I bought one of the most expensive kinds at my Whole Foods – Nutiva brand – about $12 for 15 oz. I would say the cookies had a hint of coconut flavor, but that didn’t bother me. What was great was that they were nicely soft and chewy and stayed that way the next day. I tried 2 Vegan Choc Chip cookie recipes that night and the other cookies were harder than a brick bat the next day, as my Grandmother used to say. The other recipe used Vegan Butter and Flax meal, so I wanted to try it. Need to shorten the cook time perhaps. Thanks for a great recipe. Yes, definitely! Wheat flour soaks up more moisture than regular flour, so it would definitely give you a dryer dough. Also, if you didn’t weigh out 4.5 ounces, it’s possible that your cup of wheat flour weighed more than 4.5 ounces, which is what a cup of flour (at least in this recipe) is supposed to weigh. Thanks for the note! It sounds like you might have used a little too much flour by accident. Did you weigh it? If you didn’t weigh it, it’s possible there was a little too much flour packed into the cup. I don’t think it was the agave syrup. If you take another shot at it, try using a tiny bit less flour and slightly more melted coconut oil than you did before. So I tried this recipe and it tastes yummy but I had to substitute the maple syrup with Agave nectar syrup instead. I had a really hard time making the dough stick together. I got frustrated and added chia seed to make it stick better. I don’t know if the coconut oil should have been more solid because I melted it by leaving the jar near the stove. OR, if the maple syrup was truly imperative in this recipe. What did I do wrong? HELP! While I love the health benefits of using coconut oil externally, I have to say I do shy away from it when it comes to cooking and baking. The oil is so high in natural fats, I use ground flax seed as a subsitution for butter and eggs, usually 3 tbsp mixed with water per egg, and 3/4 c per cup of butter/margarine. I’m looking forward to trying out this recipe! I just picked up so coconut oil to use for a coconut cake, and wasn’t quite sure what to do with the rest of it. This will be a great treat for my cookie obsessed toddler! Here in Minnesota in February, coconut oil is a solid at room temperature. I decided to warm the coconut oil-vanilla-maple syrup mixture because the solid-ish coconut oil didn’t want to blend very well with the other liquids. My cookies turned out pretty flat. Was the coconut oil a liquid when you used it? Perhaps I just needed to add more flour. Hmmm. I used whole wheat pastry flour. What would be the weight measurement of a cup of this flour. The warm liquid kind of melted the chocolate chips which is OK but made them even less like your photographed cookies. I’m eager to try other baking with this more healthy fat. I’ve mentioned before I’m a huge fan, now I’ll have to try the cookies with it. word of caution to those new to it, start with a smaller amount if you’re going to add it straight. A Tablespoon of straight coconut oil or any medium chain triglyceride oil may have a laxative effect until you get used to it. If it helps with walking the dog, I’m sold! I believe I’ve tried that recipe of Dreena’s, too, but it’s hard to find good brands of coconut oil around here. I’d love to try that Kelapo brand if I ever found it. What kind of choc chips did you use? I tried the “enjoy life” brand and didn’t care for them. This is my favorite vegan chocolate chip cookie recipe. I make it ALL the time :). I also love using coconut oil for a skin moisturizer–it makes me smell so good! My Trader Joe’s just started carrying coconut oil. I read somewhere that coconut oil has more water in it than butter, did you have to adjust your cookie recipes or were they ok with a 1:1 swap? I guess I need to try a different brand than what I’ve been using. It’s ok but I don’t love it. Other family members have liked things I’ve made with it but I’ve been unhappy with the way it leaves a coating in my mouth. Sounds crazy I know. The recipe says 1/3 cup of canola or vegetable oil. Did you substitute the same amount of coconut oil? Looks yummy and I have coconut oil at home!! I went through a phase of cooking/baking with coconut oil a few years ago and loved it. For some reason I stopped but you’ve inspired me to go out and buy a jar! Coconut oil used to be a main ingredient in inexpensive packaged cookies and the oil gave them a tasty hint of coconut flavor. I remember that from when I was a kid, but it may not be used that way any more. I love coconut oil! I have 2 jars of it in my cupboard and I use it daily!! I use it for cooking, baking, adding it to my tea, and as a skin moisturizer. You’ve convinced me! Am going to hunt some down.